Flowering Baby is a curriculum for children ages 5 and under with a emphasis on developing language, cognitive, emotional, social, abilities and both fine and gross motor skills. The curriculum is designed to be used daily for 20 to 40 minutes of focused time with your child. The activities are based on age until the age of 3 when the curriculum changes and is arranged monthly and by various themes. The curriculum contains 5 age-specific levels. The levels include activity, game, book, craft, and song ideas. While specific books and song CD’s are listed in the curriculum guide, it would be easy to substitute similar titles within the curriculum. The first 3 levels can be purchased for $30 each. The last 2 levels can be purchased for $38. The entire 5 levels can be purchased for $132. Click here to purchase Flowering Baby from their site. I received PDF files of each of the 5 levels of Flowering Baby curriculum. Birth to 1 Year – Each month there are 20 lessons which include an activity and a book or a song with the aim of exposing your baby to various sounds, words, pictures, and textures. 1 to 2 Years – This level includes one or more activities each day with a book or song suggestion. The goal of this level is exploration with a focus on directional tasks. 2 to 3 Years – This third level of Flowering Baby begins to introduce some formal academics. Ideas are included for physical activities, science experiments, imaginative play, books, songs. This level introduces the alphabet, shapes, colors, counting, and some simple Spanish words. 3 to 4 Years – This level contains two parts a general guide with math, language, science, and physical activities and a themed guide which is like a mini unit study with activities, crafts, and book ideas. This year focuses on letters, letter sounds, counting, shapes, colors, and patterns. 4 to 5 Years -Like the previous level, this one also contains two segments-general guide and themed guide. The themes include holidays, seasons, animals, and sports while the general guide promotes language and math skills such as writing letters and numbers, counting to 50, learning about America, and exploring with hands on art projects and physical activities. I used 3 levels of this curriculum simultaneously. One week Punkin enjoyed tummy time while looking into a mirror. She also looked at objects and pictures in a book, thanks to her big brother and sisters who helped out. They read to her every single day and showed her pictures. Punkin also had help putting some soft baby toys in her mouth (Ladybug required lots of supervision as she helped with this part) and got a fun lotion massage from everyone (my towels and sheets got a lotion massage too somehow). Ladybug learned Wheels on the Bus thanks to Curly. She now walks around the house yelling, “round and round and round and round.” Bee helped teach Ladybug to dress herself and taught her some animal sounds. Her outfits of choice usually includes several pairs of socks and her favorite animal sound is “neigh;” she’s a horse lover just like me! Ladybug played some musical instruments and practiced hopping forward and backward. But her favorite activity by far was water play, we did that one for several days. Ironically I had to do extra laundry on all of those days. She also loved reading the books together. Love encouraging my little bookworms! In one week, Bee learned how to sequence activities using various sequencing cards. We worked to name the months and learned the seasons. She practiced drawing circles, drawing with both hands, and counting to 10 with cereal and then eating it afterward (Tiger and Curly helped her finish off her snack). She also learned about colors and shades thanks to a collection of paint chips and then we talked about our senses. For her themed activities, she learned about the arctic and sorted arctic animals by habitat-water or land. She learned to find the arctic and antarctic on the globe and the girls put on a winter themed fashion show with wintertime outfits. It was a busy week! I wished that the program also included some printables for the older age groups. For example, one of the activities was to use sequencing cards to correctly order events. It was suggested to purchase these cards. I was able to find some free online cards through some searching. However, I would have preferred to have a few printable pages to go along with the curriculum. Sequencing cards and maybe some simple coloring or craft pages that corresponded to the activities would have been a welcome addition. The curriculum is very well laid out. Planning is simple-you just do one or all of the activities listed for a particular day. It was so easy to plan. I just copied the activities I wanted to do on the correct day in my planner and I was done! Because the activity suggestions are laid out in the guides with book lists, song ideas, activities, and craft ideas, I didn’t have to spend my time searching for ideas. The supplies are all relatively simple and we had many of them on hand-if we didn’t it was easy to improvise. I was thankful that extra shopping trips for supplies was not required! This curriculum actually gets done at my house. Because there are only a few activity ideas per day, I didn’t feel overwhelmed and we were often able to complete all activities for each day. The program doesn’t take much time to implement daily, which meant I was able to spend time with all my kids each day-giving them all some focused “school” time. We had so much fun together! But I think one of my favorite things about the curriculum is that older siblings can easily help out with teaching or even participating. Tiger and Curly wanted to run “school” for Ladybug and Punkin. I verbally gave them the lesson plans for the day and they were thrilled to help teach. It allowed for some fun sibling time with activities that everyone could do. And my big kids loved participating. We have really enjoyed this curriculum. While I don’t think formal school is necessary for young children, I think a few well organized developmental activities are beneficial. Also, my little ones beg to do school like their older siblings. I have found that I don’t have the time to search internet sites and page through activity books to select ideas for them. With Flowering Baby the ideas were all laid out for me. It was enough to satisfy the little people and was not too much that it did not get done. So, in short, I loved using it! We plan to continue using all the levels of this curriculum as my kids grow. It’s doable, simple, effective, fun, easy to use, and helps me plan focused time with the littles so they don’t feel overlooked in our busy days. 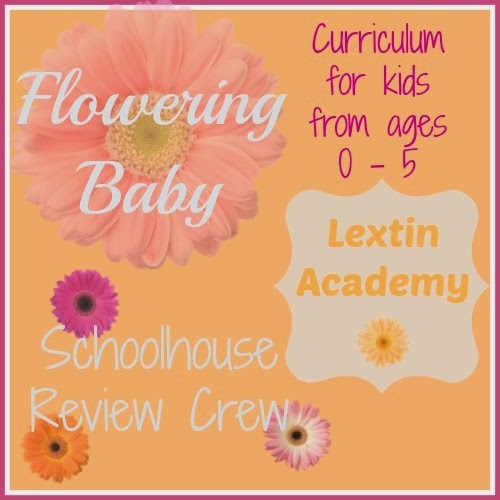 Discount: Flowering Baby is offering my blog readers a discount on the curriculum. Use the code Blog10 to receive a 10% discount at checkout! Read other Review Crew’s thoughts on this curriculum on the Crew Blog!